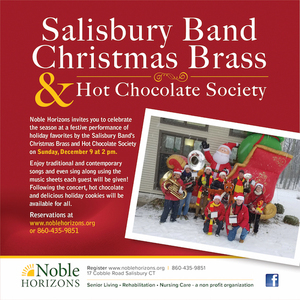 Noble Horizons invites you to celebrate the season at a festive performance of holiday favorites by the Salisbury Band's Christmas Brass and Hot Chocolate Society on Sunday, December 9 at 2 pm. Enjoy traditional and contemporary songs and even sing along using the music sheets each guest will be given! Following the concert, hot chocolate and delicious holiday cookies will be available for all. Reservations at www.noblehorizons.org or 860-435-9851. Noble Horizons is located at 17 Cobble Road in Salisbury, Conn. Call 860-435-9851 for reservations. The event is free of charge.